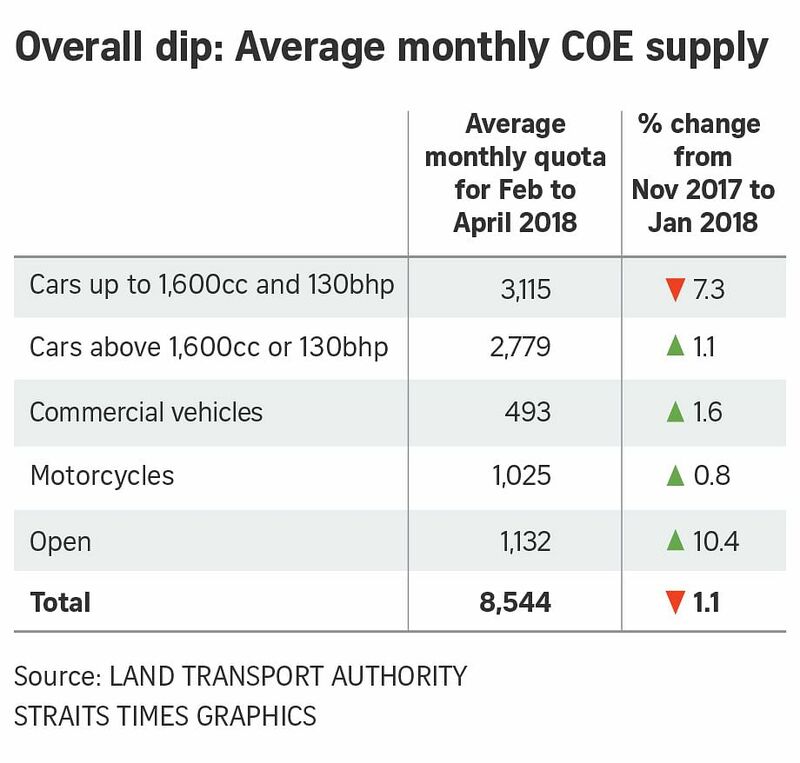 SINGAPORE - There will be fewer Certificates of Entitlement (COEs) available for car buyers from February, with the car quota shrinking 3.5 per cent to a monthly average of 5,894 - down from 6,108. Overall, the COE supply will fall from 8,635 a month currently to 8,544 - due primarily to the fall in supply for the small car category, or cars up to 1,600cc and 130bhp. The supply in that category fell to 3,115 from 3,360. The Open COE category, which can be used for any vehicle except motorcycles, will have a quota of 1,132, up from 1,025. Meanwhile, the supply for motorcycle COEs went up slightly from 1,017 to 1,025. This is the first quota affected by the new zero vehicle allowable growth rate. In October last year (2017), the Land Transport Authority (LTA) said it would lower the vehicle growth rate from 0.25 per cent per annum to zero per cent with effect from February for all COE categories except commercial vehicles. It cited Singapore's land constraints and a commitment to continually improve the public transport system as reasons. The growth rate for commercial vehicles however will remain unchanged at 0.25 per cent until the first quarter of 2021 to provide businesses with more time to improve the efficiency of their logistics operations and reduce the number of commercial vehicles that they require. From February, the monthly average quota for commercial vehicles will go up slightly from 485 to 493.